Successfully Added PDA Internet Cellphone - QWERTY Keyboard + SNES Emulator to your Shopping Cart. PDA style cell phone with a fully functional QWERTY keyboard, and featuring WAP internet access as well as SNES game emulation for getting retro gaming session on. This media rich phone is truly convenient as it is a sliding phone with its own information screen when closed for easily making phone calls and checking SMS messages, but when opened becomes a multimedia and work station PDA beast. Perfect for work and for play, send/receive SMS, MMS and even EMS (email) on the go and then using WAP, check out your favorite internet sites. When on the bus or just in a lazy mood, play one of your thousands of Super Nintendo or Nintendo emulated games or MPEG4 movies on the beautiful 2.8 inch TFT QVGA PDA widescreen display. To top it all off, Chinavasion will freely throw in a 1GB TF (micro SD) included with the purchase for letting you throw hours of movies and music as well and as roms. Yes, this is a great gaming cell phone, but let us tell you what else what other premier features you get with this multimedia mobile phone; TV, FM radio, digital video and still cameras, image viewer, Ebook reader, and easy to use (with extra large capacity) messaging environments for SMS, MMS, and EMS messages. All the texting and media options on this phone are easy to use and well integrated into the phone operating environment. The CVSDW-9801 game and TV cellphone is proudly brought to you by Chinavasion Electronics. Order your stock now and don't forget to sell your customers additional add-on accessories like belt clip cases, protective sleeves, and bluetooth earpieces to maximize your profits. 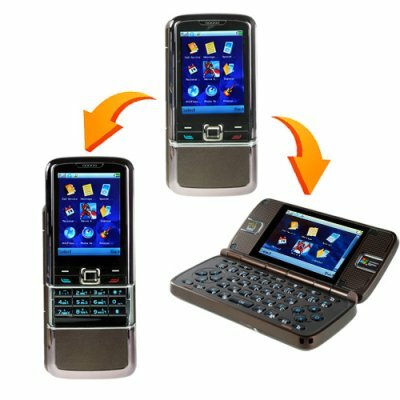 Dual functions: Sliding Phone for making phone calls/SMS messages while closed, and fully functional QWERTY PDA when open. Included 1 GB Transflash memory card. Use U-Disk/Media File Manager to quickly and easily copy files onto your phone. NOTE: This product is compatible with the worldwide standard GSM frequencies of 900MHz and 1800MHz. Please check with your local provider if you are unsure of your local band requirement. What languages does the dual band cellphone come in, I do not see mine ________ listed? The phone comes with a default selection of languages which are - English, Spanish, Portuguese, Malaysian, Indonesian, Vietnamese, Russian and Thai. If you need other languages and plan to order a large quantity (25+ pieces) then we may be able to supply it with the particular language you need. Does this have the Portugese language? Unfortunately, this phone does not come with the Portugese language. Hi does your phone have Wi Fi wireless network feature? Or do you have one that does have this feature?? The phone does not have Wi Fi. In the future, we may have phones that have the Wi Fi feature. I live in India, can I buy this phone? No. This phone is not for export to India because of existing OEM agreements. I'm no stranger to buying things from china and japan, but I must say that this was the fastest delivery i've ever received, Delivered within 4 days from order to opening the box, oh and the phone.... I forgot it's great, has many functions, nes and snes games plus tv with 2 batteries to boot, you can't ask for more. I must say it is an Excellent product to offer to indian business class People. This will be really helpful product to keep your Office to your pocket. With one can not only receive calls but also receive mails & SMS & if tv supports one can keep an eye on the market also & keep him self updated even while travelling away from office.